Subtle with a flicker of fire, this stunning floral arrangement is perfect for a someone who loves life, but also values understatement. 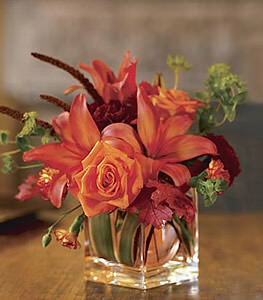 A stylish clear glass cube vase, filled with Asiatic lilies, orange roses, burgundy carnations, orange bi-color carnations, flax and bupleurum, accented with autumn leaves. The arrangement was well received. I sent the recipient a copy of the advertised basket (its always a concern to me that what I think Im sending and what it actually received wont even closely resemble). I was delighted to hear that what was sent was better. Believe it or not, what I got was much prettier! Please thank the designer for their work to meet and exceed our expectations!